When I joined up Arealight as a spokes person one of the tasks I was given was reviewing products. To be completely honest, I’ve never done this before so this will be the first review I ever do but definitely not the last. The way this will work is that I will have several items of a single type in one photo. And I will include single photos as necessary. We all know slow loading times are lame, so I want to keep those loading times as low as possible. I also apologize for the photos, my room is currently a mess as I still haven’t gotten around to making room for a photo space so I’ve been making due with a little area of my desk. So, I suppose the best starting point would be the airborne helmets. 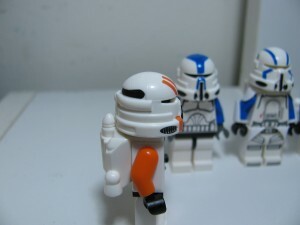 So for about $5.00 USD, you can purchase one of these four helmets. The price itself is actually pretty decent when you take into account that the helmets themselves retail for $2.50 and most retailers who will do printing, charge a lot more for the printing on flat surfaces. 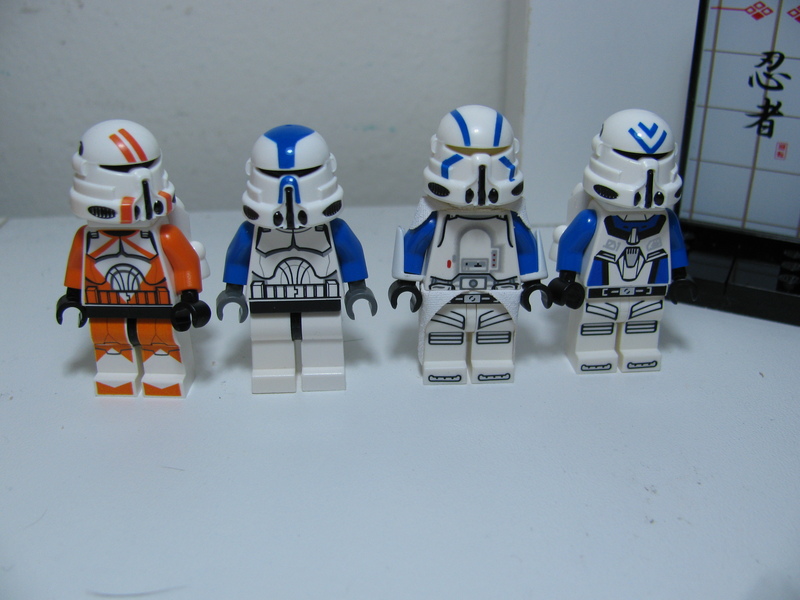 These figures consist of Brickforge Vambraces, MMCB Waistcape and Pauldrons, Lego Torsos [Clone trooper torso / Snow Trooper Torso/ ExoForce Torso] and Legs [Series 1 Astronaut / Clone Trooper Legs]. Utapau Airborne trooper helmet, a 501st Airborne helmet, Commander Keller Helmet, an Airborne sharpshooter helmet. 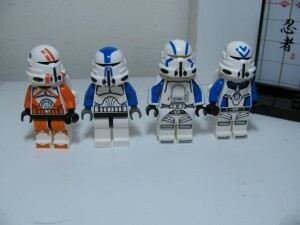 Each of them look the same on the back and only have the black stripe on the back except for the 501st airborne helmet, which has it’s design continue from the front to the back. The Arealight Jetpack is a tight fit and you can only use the warhead without any real problems with moving the helmet. The only thing is that the helmet itself locks into place if it’s put in a straight forward position. Here is a side view of the Utapau helmet. One of the two problems I do have with the helmets is the fact that the printing on the stripe on the back goes out of the indention on the helmet, but this is easily fixed with a bit of brasso and paint. The other problem has to do with the vents on the lower part of the helmet. As you can see, there are some white areas showig out of the black, but other wise these are great helmets. 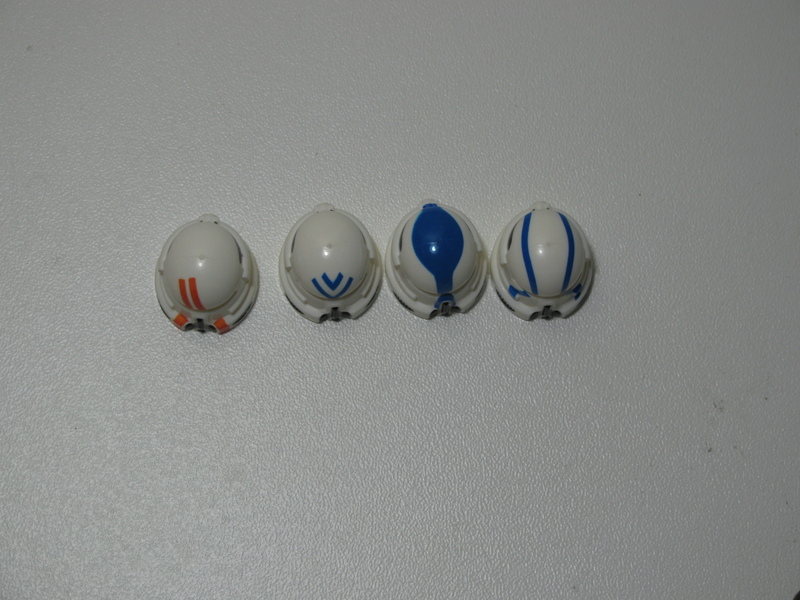 Here’s an overhead shot, as you can see the pattern on the 501st and Keller Helmets go from front to back. 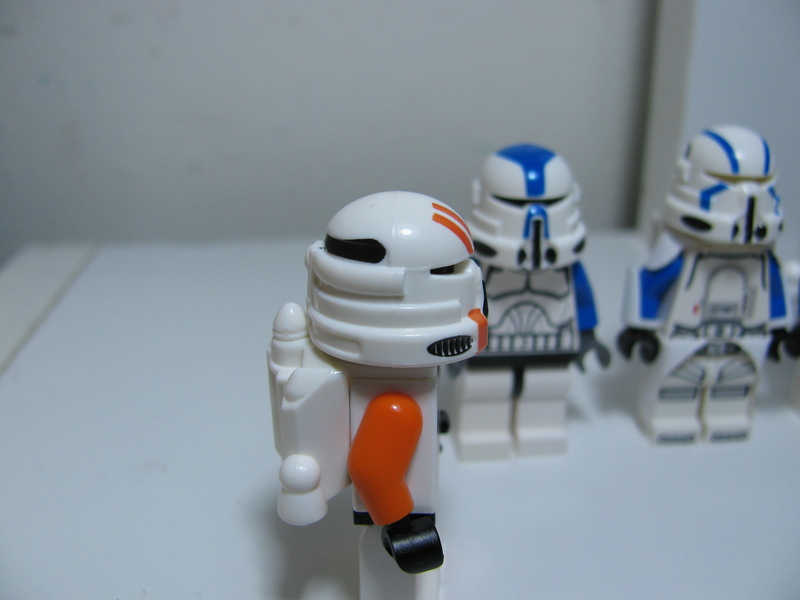 Utapau Helmet: This helmet is actually is quite accurate from what I can tell and matches the Lego orange quite well. 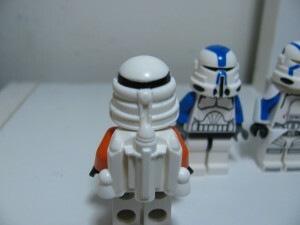 501st Helmet : This one has a single production error on the front of the helmet above the visor, there seems to be what looks like a small chip on the very front of the design. However, Arealight did do a good job of matching the reference picture. The helmet I received of this one is a bit less defined than the rest on the edge of the design in the back. Keller Helmet : You really can’t go too wrong with this one. It matches the reference quite well and I personally love the cleanness of the design itself and how it fits so well on the helmet. 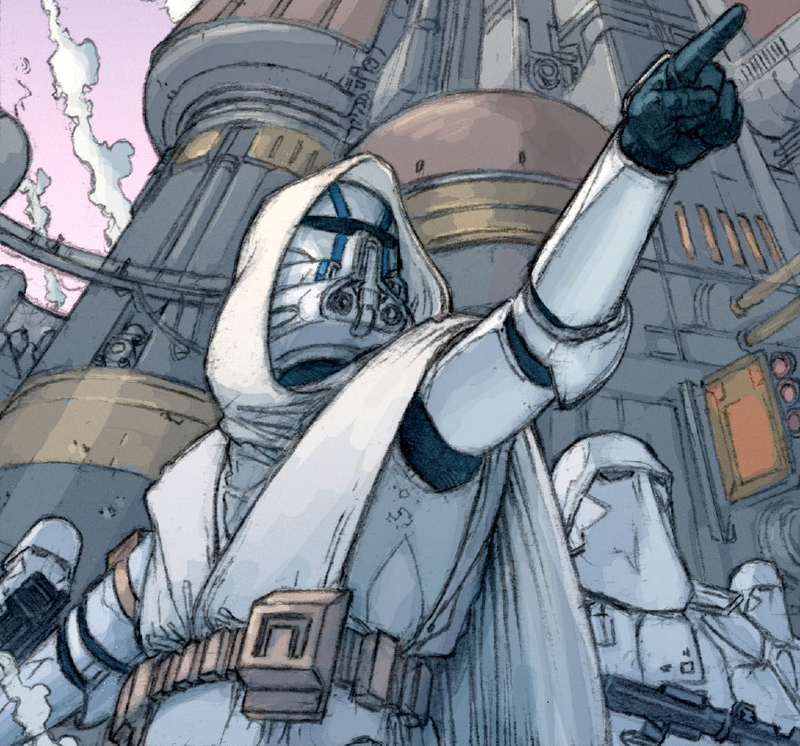 Airborne Sniper: Arealight, once again, did a good job of matching the reference for this helmet. The sizing on the design is quite nice in relation to the helmet size. Overall, I’d have to say that these are pretty good products. The printing in general is pretty crisp and clean and Arealight did do a very good job in matching the reference pictures for these products. The only real problem I found was the line in the back going out of the indention that it seems to be made to fit into. If you’re trying to decide which ones to get out of these (due to lack of funds or what not), I would personally suggest the Keller Helmet mainly for the reason that the design on the helmet itself is very clean and works quite well on this helmet honestly. Thank you for your time and please check back for future reviews and possible “How-To”s. This entry was posted in Reviews and tagged Airborne, Helmet, print, review by Confuzzled Apples. Bookmark the permalink.